This time last year, our founder Zach Weisberg and I were navigating around USC in the heart of Los Angeles to find parking. Travis Rice’s newest film, The Fourth Phase, was set to premiere at the Shrine Auditorium across the street from the Trojans’ campus – the same place that Bob Dylan played just a few months before. Point being, it was a sizable turnout at least two hours’ drive from the nearest mountain with the fanfare you’d expect at the premiere of a Hollywood blockbuster, not a snowboard film. 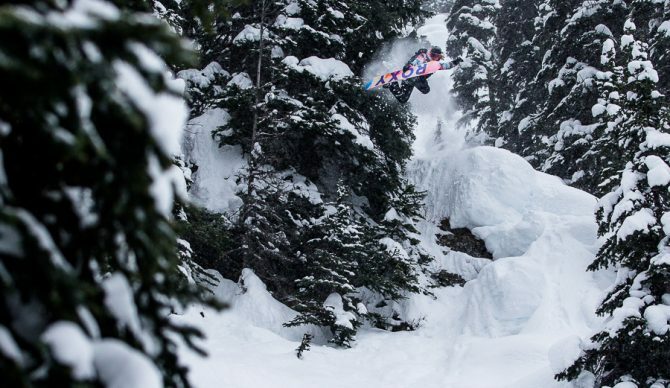 The hoopla is a testament to the wildly ambitious film projects that Travis Rice has undertaken over the years. From That’s It, That’s All to The Art of Flight to The Fourth Phase, and the reception they’ve received goes well beyond the world of snowboarding. Depth Perception is all filmed in the B.C. backcountry. What was it like to have Travis Rice and the other Quiksilver team riders in the film in your neck of the woods? Especially with your local knowledge. Actually, that’s something that’s so special about snowboarding and the film is that, like, really growing up in B.C. you take for granted what you have because you’ve always just known that. You’ve known that the terrain is insane and it’s beautiful, and we live in this amazing nature Disneyland of the world, and really until you start traveling you don’t really realize that you live in the Holy Grail. And it’s been very apparent in the last 10 years for me, after traveling, to kind of realize that B.C. is kind of the world gem of snowboarding. Totally. 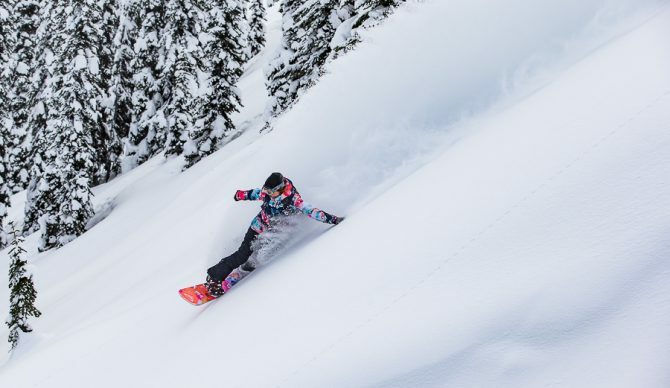 I think it’s notable, too, that you’re the first female rider to be featured in one of Travis Rice’s films. What are your thoughts around that? Um, it’s an honor. Honestly, it is. I think there’s something else, though. Like at first I was like, “Woah, this is so crazy. I’m the first female to do a Travis film,” and I was really, really nervous. And there was a lot of pressure, too that it almost made me sick to my stomach trying to like swallow it before it even happened. But, you know it was really great and the guys were super supportive, especially Travis. He was really good about making me feel a part of the crew as much as everyone else, and that was amazing. But the other thing that I think about, too, is, you know I’ve been asked a lot of questions like, “How does it feel to be the first woman to do that,” and on a darker note it almost makes me a little sad that it’s such a surprise for everyone that a woman would be involved. I mean if you look at the big picture, it shouldn’t be a surprise. It shouldn’t be an anomaly. It shouldn’t be just one token girl in a film. And I think, like, sometimes that’s kind of the way it goes. And, I’ve always filmed with girls, so I never really noticed it as much. So, it is great to be included, and it is a step forward which is awesome. And I applaud Travis for taking it on because sometimes it’s not easy. Who are some of the snowboarders that led the way for you and inspired you? It’s funny because most of those people are my closest friends. So, Leanne Pelosi and Marie France-Roy and Hana Beaman and actually Tara Dakides was a big one. I went filming with Runway Films – Leanne invited me on a trip – and it was basically the turning point for me. If I hadn’t gone on that trip, I don’t even know where I would be today. It was kind of like Leanne just called me up. And I had never really filmed. I had never had, like, a published photo. And Leanne had seen me snowboard like a couple of times, and they both just took me under their wing, and I ended up snowboarding beside Leanne for most of my career. She’s been such an awesome inspiration and she’s really brought me a lot of places, and I have to thank her so much for that. And yeah, also being on the Roxy team. The girls involved there, I mean, Roxy made me who I am. They let me have the creative input to be who I am. They were basically like, “Well, what do you want to do?” And I was like, “I want to ride powderrrr.” And they were like, “Okay, well you’re just gonna do that. That’s gonna be your focus. And Amber Stackhouse who was my team manager basically just handed over the reins to me and said, “Do what you’re best at.” So I had my brand and Leanne and Hana and all those girls around me supporting it, and it just kind of happened like that. And it kept happening like that. I’ve actually kind of been dreaming up a project with a couple other girls on the Roxy surf team. It’s kind of like an alternate reality piece between surf and snowboarding called Parallels. And who knows what will happen, but that’s my big dream is I kind of want to do something that I have a vision for, but I do want to keep filming with the crew I’m on also. To learn more about Depth Perception or find a screening near you, click here.